I discovered this artist via Lucy Williams’ instagram and fell in love with her ceramic scallop shell at once. 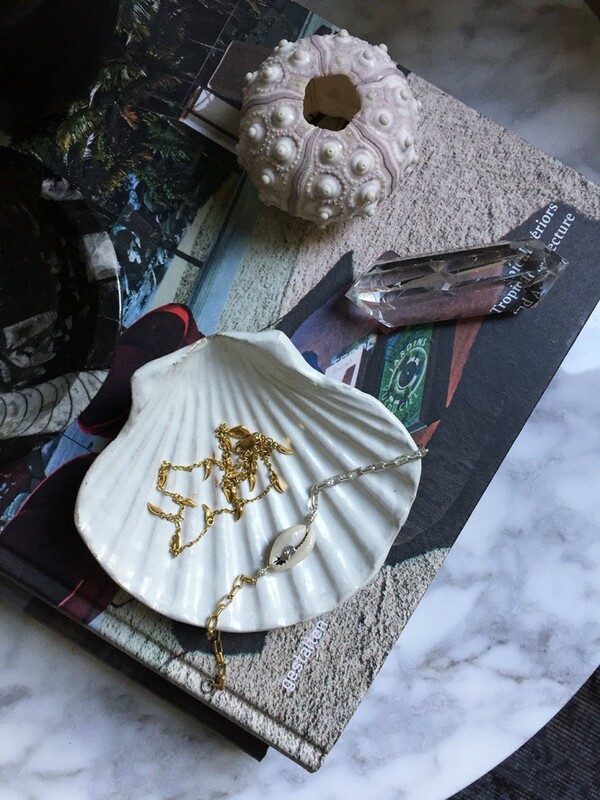 As you might know I love decorating my home with sea shells, crystals, corals and the like – and this ceramic shell looks so beautiful as a jewellery tray, doesn’t it? … Speaking of jewellery: I have added some colourfull pieces to my collection! 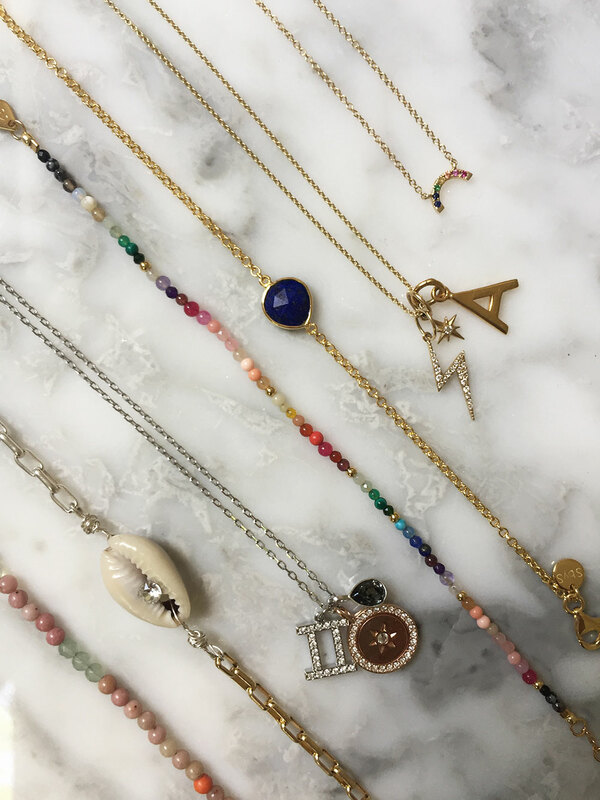 From left to right: “Strawberry Blonde” bracelet by Anni Lu, “My name is” bracelet by Wald Berlin, Zodiac necklace “Gemini” by Swarovski, “Iris Light” bracelet by Anni Lu, “One Stone” bracelet by Sophie by Sophie, pendant necklace by Nives, rainbow necklace by EF Collection. It’s incredible how happy it makes me to find the perfect basics, especially denim pieces. This denim jacket, “Alia” by Wood Wood, is certainly one of them, and since I’ve bought it I have pretty much worn it every day. 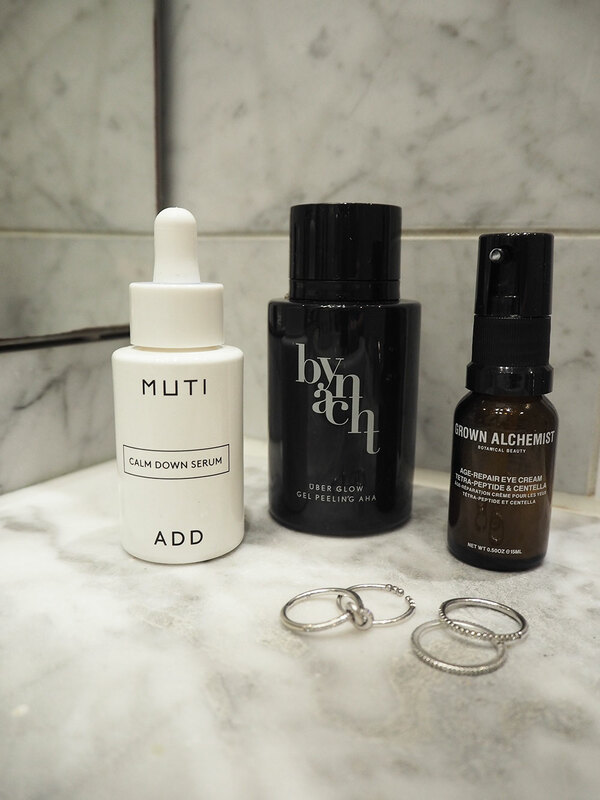 You know I am a beauty addict – and these are three discoveries that I absolutely have to share with you: MUTI’s “Calm Down Serum” helps to improve stressed skin: it reduces redness and moisturizes the skin. By Nacht’s “Über glow gel peeling” is an amazing exfoliator, which renews your skin with fruit acids. And I have discovered a new eye cream: Grown Alchemist’s “Age-repair eye cream” (via Niche Beauty) makes the area around my eyes feel very smooth and nourished and it’s a great base for my eye make-up as well. I am obsessed with anything coconut scented – perfume, lip balm, hand cream and especially hair care. I have been using the “Mermaid Hair Shine Spray” for a while (mainly because I love the scent – Haha) and I am now finally trying out the shampoo (via Niche Beauty) as well. The scent is amazing and so far my hair really seems to like this shampoo, too. 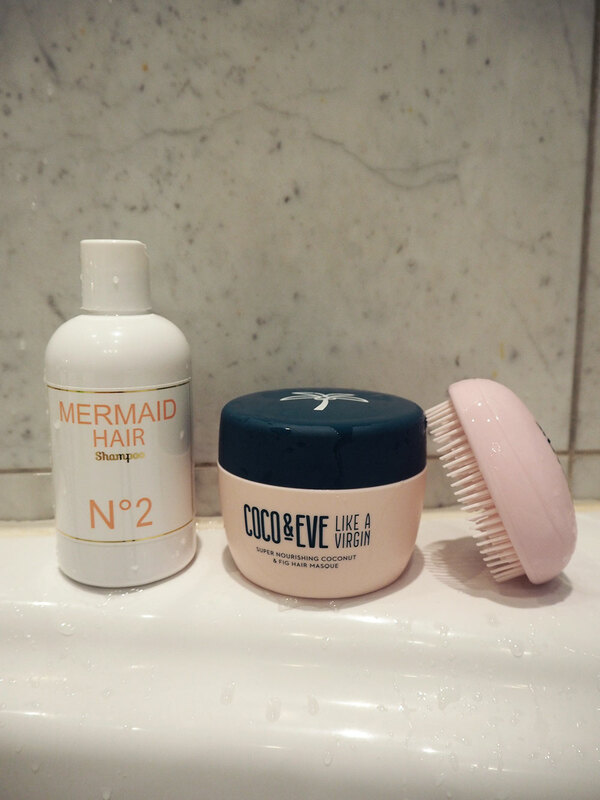 Maybe you have seen the Coco & Eve hair mask advertised on Instagram? I admit, these ads totally worked in my case – I was very curious to try out this hair mask which promises to turn brittle hair into glorious, shiny waves (and yes, it, too, has a coconut scent). And, what can I say, this mask actually does make my hair feel very soft, nourished and strong. One of my favourite types of shopping experiences? 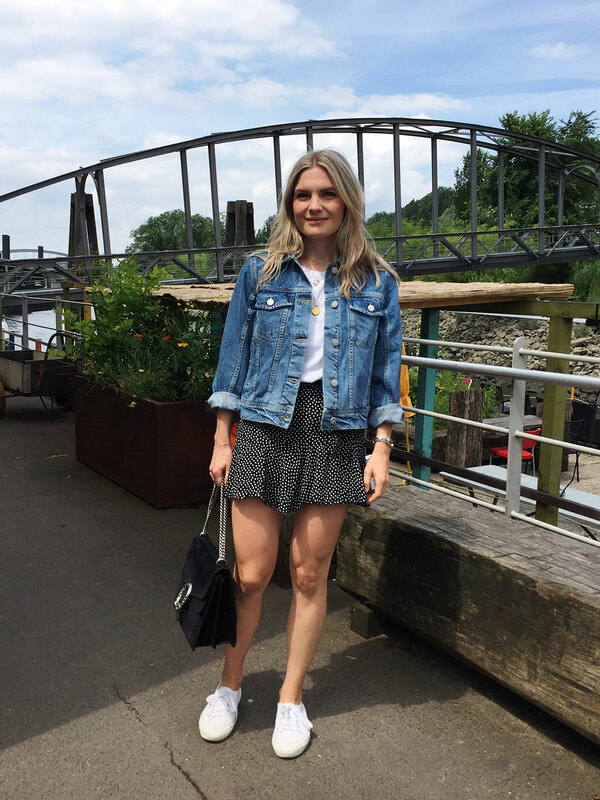 Online vintage treasure hunts! 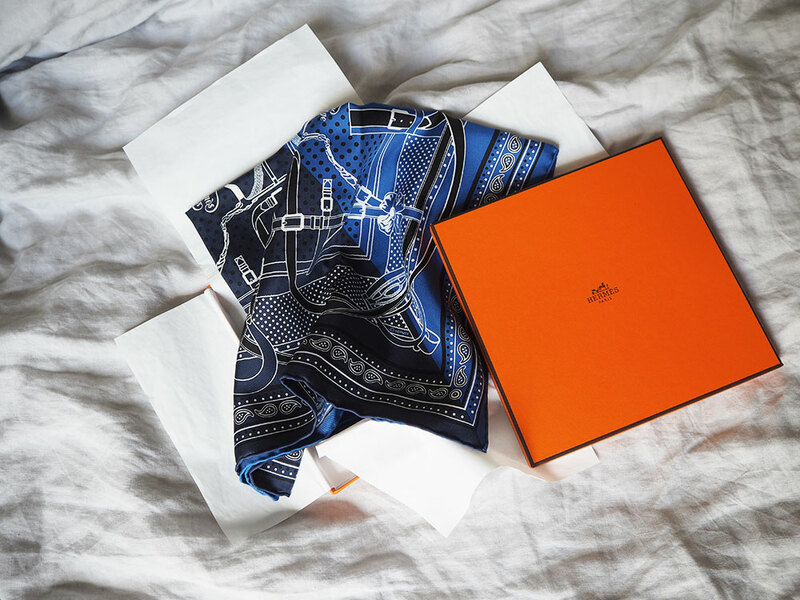 … I remember when Hermès launched their silk Bandana scarves in 2014 – I marveled at them at their press event, because I’ve always loved anything Western-themed and because they are such an elegant take on the classic cotton bandana (a staple accessory in my wardrobe). The bandana scarves are not available in stores anymore, but a few weeks ago, I found one of my favourite versions – in blue and navy – online: second-hand but brand new! Yee-haw!